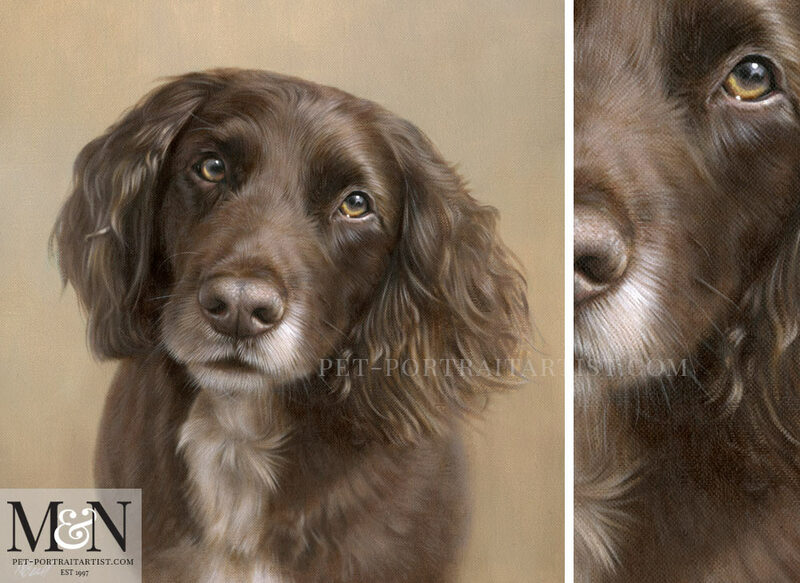 Welcome to our Spaniel oil portrait of Wilf. 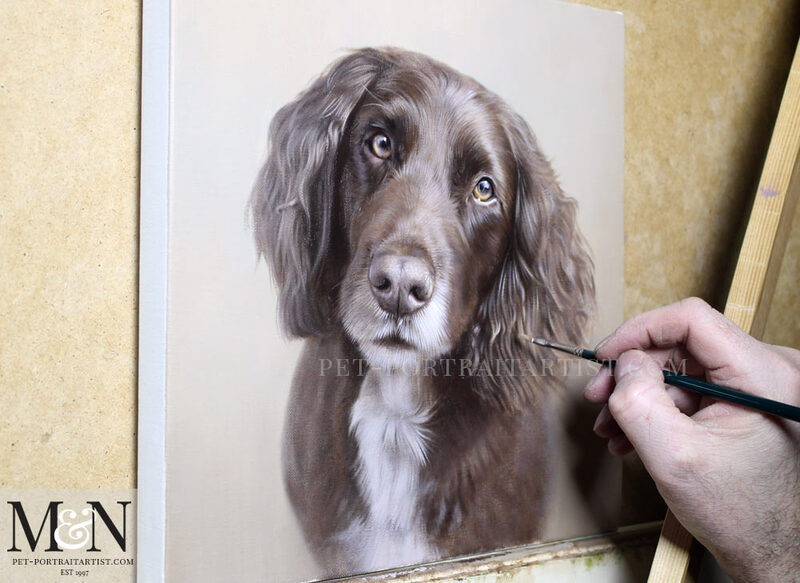 Steve contacted us asking if we would be able to paint his gorgeous spaniel Wilf who had sadly passed away. Steve’s first email was wonderful. We really appreciated his words and were thrilled to hear he loved our artwork in both mediums. Steve asked to have a 12 x 10 portrait, however we all decided to opt for an 11 x 11 inches portrait. We have our canvases made bespoke so different sizes are never an issue. Wilf’s ears are quite wide in the photo and so we felt there needed to be a little more room in the portrait so a square shape suited him the best. 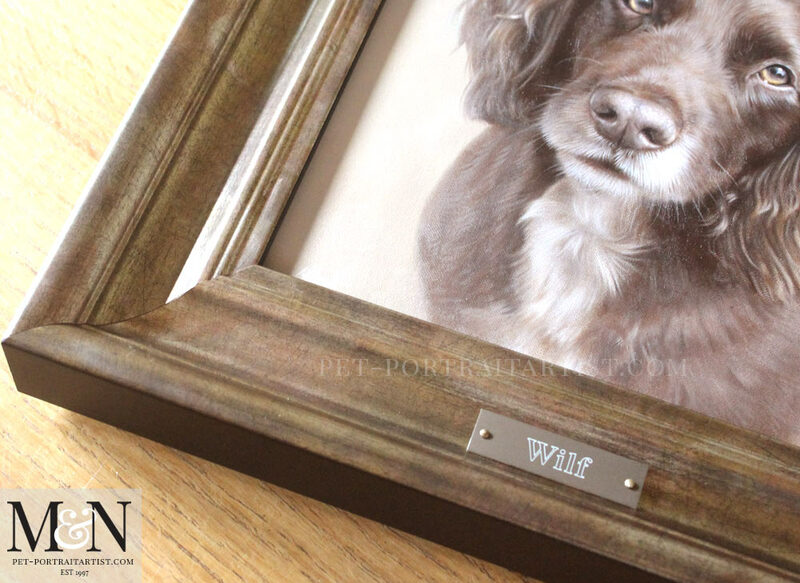 Nicholas thoroughly enjoyed painting Wilf, we both have a soft spot for spaniels and quite often have a number in our commissions list to paint or draw. Steve was thrilled when he saw the final scan of Wilf and you can read his email below. Scroll down further for more photos and video of the portrait. Please assure Nicholas it’s absolutely perfect ! Thank you for taking such care. We’re looking forward to seeing the final article in due course. Here is a wonderful email form Steves white, who the portrait was for. She had a wonderful surprise and we are delighted. Thank you so so much for this beautiful painting of my boy Wilf. Your husband has caught him to perfection – brought tears to my eyes to be reminded of what a handsome dog he was. Thank you! 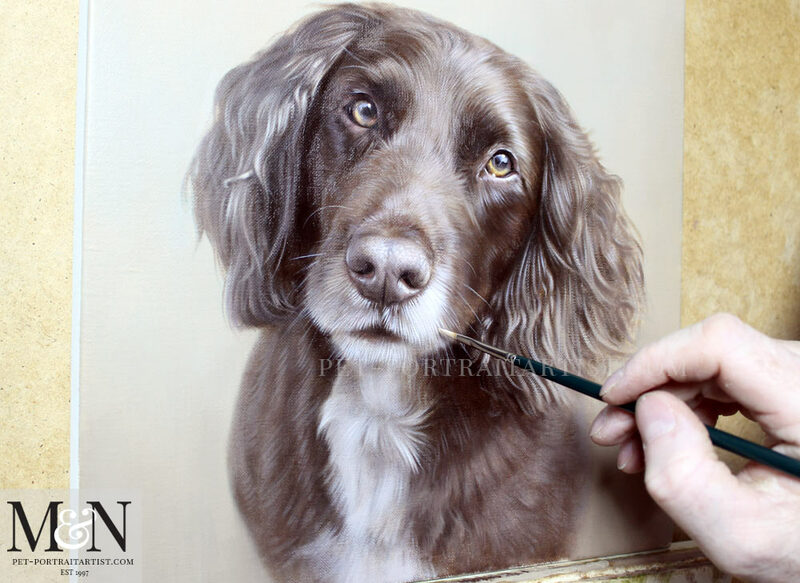 Here are a few photos of the portrait of Wilf in progress. All of our clients receive every stage of the portrait. Depending on the size and complexity we can send between 10 to 20 photos or more during the process. We have added a couple of stages below for our readers to see. They show Nicholas painting with his brush in hand. The photos we feel give a much more three dimensional feel to how the portrait actually looks. Often the scans can make the artwork look quite flat. We hope that you like them! I have been taking a video of each frame that we commission so that our prospective clients can see it in more detail. This is my third video and I’m getting the hang of it gradually. I have added it to our website and thought readers might like to view it here too. You can see the Langham frame page on our website and if you would like the Langham frame for your portrait, just drop us a line and we can get a quote for you. You can also see plenty of photos on our website of the different plaques we have had made. 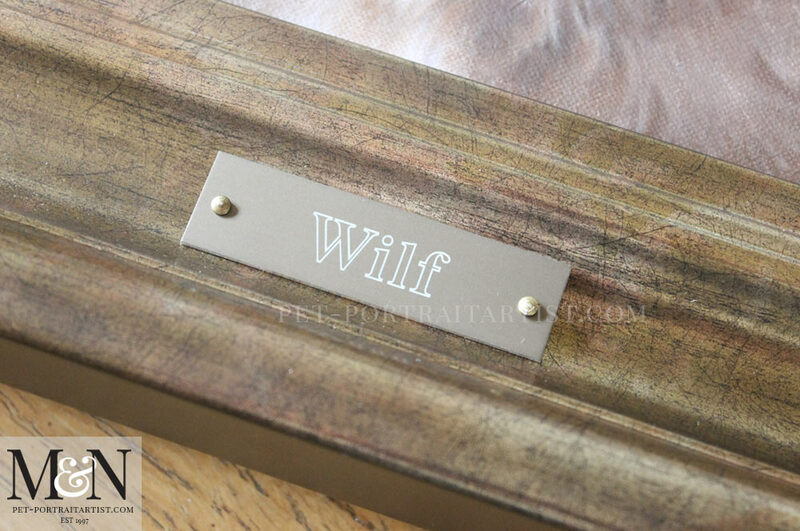 Our engravers are fantastic and can engrave on Gold, Silver and bronze. They can write as much or as little text as you wish. The portrait of Wilf overall has lots of warm brown tones, including the frame so we opted for a Bronze plaque which works really well. We hope that you have enjoyed viewing our Art Studio Blog. Why not sign up to our Monthly newsletter accessible at the bottom of our websitewhich comes out on the 1st of each month. You can catch up on all of the portrait stories and news from our Art Studio! Please don’t forget to subscribe to our Youtube Channel too, share, like and follow our social media and you are more than welcome to comment below, we love hearing from our readers!